The new patio outside the Student Recreation Center gives students a new place to sit outside with friends and also gives the class of 2019 an opportunity to reflect on their time and impacts at Rider. 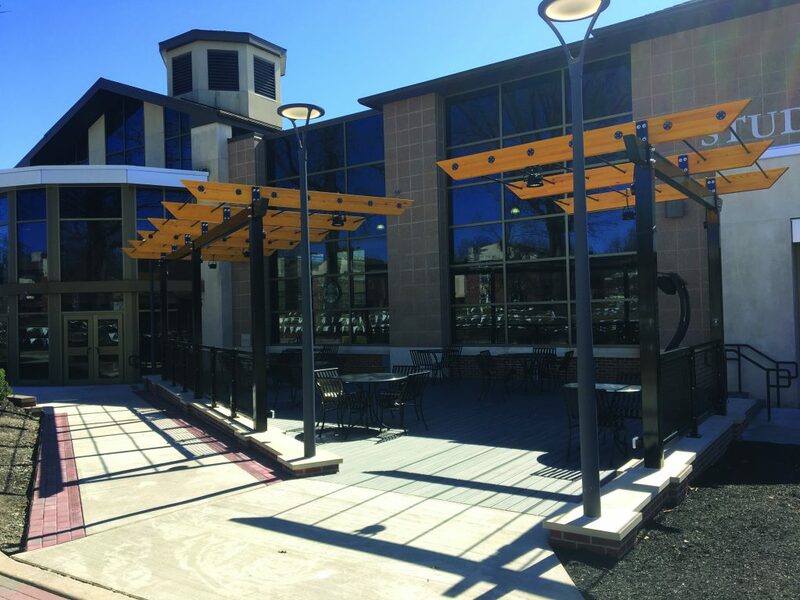 After a cold and snowy winter in Lawrenceville, New Jersey, a new addition to the Student Recreation Center gives Broncs a place to enjoy the budding spring. Located outside of the building is a new patio seating area featuring the Legacy Walkway, donated by Rider’s senior class of 2019. Senior class president Olivia Battinelli said the new patio is not only aesthetically pleasing, but it allows members of the senior class to reflect on their time at Rider. As the weather begins to warm up in the spring season, this patio provides a place for students to sit and do homework, catch up with friends or just enjoy the sunshine. Just steps away from the Bronc Bites food truck and Starbucks, students can enjoy their drinks and snacks at the tables and chairs on the patio. For Kathleen Collins, a junior musical theater major, the patio has already provided opportunities for socialization. “It is such a great place to meet up with friends and enjoy the company of my classmates,” she said. Battinelli said that her impact on Rider was finding ways to get involved as much as possible during her time on campus. She advises underclassmen to do the same. Sophomore musical theater major, James Vinson, said he has already felt the impact of the Legacy Walkway on his Rider experience.